According to the ASPCA the majority of dog owners just have one dog (63%), 25% own two, and 12% own three or more. Having multiple dogs in the house increases the fun and companionship but it can also be a source of stress if the dogs don't have a good relationship. Your house should be set up accordingly to have multiple dogs with fencing and boundaries clearly defined. Time with each dog to play with a human companion is very important as is fostering appropriate play between the dogs. Multiple dogs mean extra mischief if there are things left around the house to be gotten into. Don't forget grooming, training and vetting considerations. If you are just a one dog house hold these same factors should be considered so you can have a positive stress free relationship with your pooch. When you bring a new dog into the household the first two weeks are critical! If you are bringing a new dog into the home and he is the only dog he still needs to acclimate and learn the rules of the house. Dogs that get into fights right off the bat are less likely to work things out over time and the fighting can escalate into damaging battles. To the humans in the house it may appear that they are unprovoked attacks but watching the subtle signs of ugly communication is key. Bad behavior that is allowed at first can become a habit that is harder to break. Define the rules and be consistent. Don't forget it takes 45-90 days for a new dog to become completely accustomed to the household. 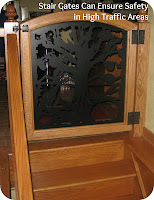 The new dog should be crated and have supervised access to the house on leash at first. Using baby gates or specially made gates that fit nicely into your decor are very helpful to everyone safe and potty habits on the up and up. Don't assume the new dog is potty trained. Go through the potty training protocol just like you would for a puppy. Set up your play, exercise, and training routine. 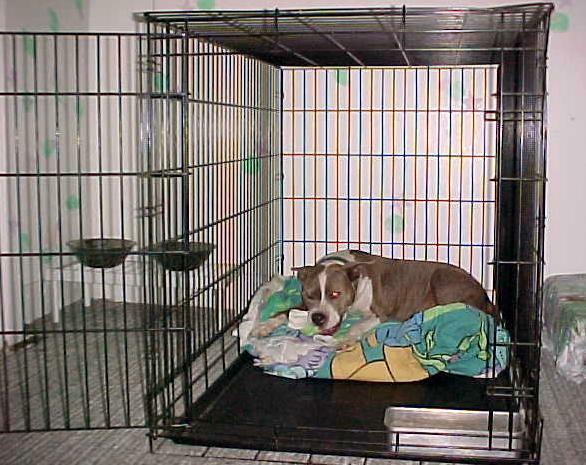 Dogs do well with structure and will fall into the rhythm of your household faster the more predictable it is. 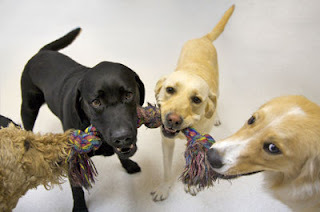 Before you bring the new dog in go ahead and brush up on the resident dogs obedience behaviors so you can have control if it is needed quickly. You will lessen the chance of fighting if everyone is polite and knows the household rules. 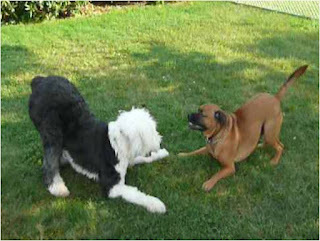 The new dog will learn from the resident dogs by watching how they respond to your cues. Using the crate to facilitate a slow introduction into the house with resident dogs makes things easy on everyone. I call this "crate and rotate". The dogs each get a chance to see each other as they take turns having freedom in the house. The resident dogs can get a smell of the new dog by checking out the places it goes while the new dog can learn about the new household by exploring with his nose. There is not a chance for a bad encounter and this will set a positive tone when you actually do introduce the dogs. 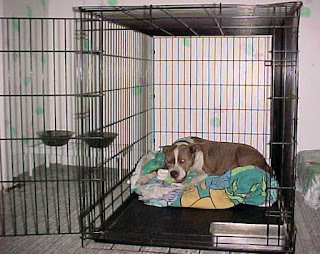 "Puppy Proof" your home so the new dog doesn't have a chance to chew wires, eat shoes, investigate dangerous areas, or escape the fence. You are learning about the dog as much as he is learning about you and the other dogs in the household during this critical time. Chewing habits, energy level, comfort with guests, tolerance of other dogs, potty training level, and social politeness are all things that will come to light the more time you spend with the dog. You will often find that more management will need to be put in place until the new dog is trained to follow your rules. When you do introduce the dogs set up a time where each dog has a handler and take the resident dog on a walk with the new dog. 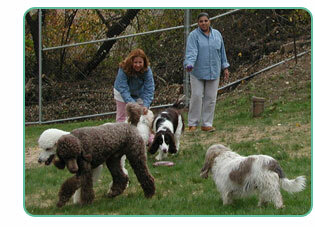 Start the dogs at a comfortable distance and walk in a circle with one dog following. This allows them to get a smell without a face to face meeting. Dogs naturally circle to greet. They tend to view prolonged face to face greeting as a rude behavior and can take offense. Trade the lead dog and circle the other way. When the dogs are acting loose and comfortable allow them to greet each other. Keep leashes loose and let them circle. If you see any stiff posturing positively interrupt the dogs and give them space. If you have trouble at this stage go back to taking a walk and do some training sessions with the dogs nearby each other. The idea is to build a positive association with the new dog. Doing this homework before you bring a new dog to the house will decrease stress on everyone involved. Be proactive in your planning when adding a new furry family member and set everyone up for success.